Maria Montessori was an Italian physician, educator, and innovator, acclaimed for her educational method that builds on the way children naturally learn. She opened the first Montessori school—the Casa dei Bambini, or Children’s House—in Rome on January 6, 1907. Subsequently, she traveled the world and wrote extensively about her approach to education, attracting many devotees. There are now more than 22,000 Montessori schools in at least 110 countries worldwide. 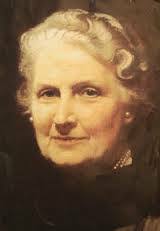 Maria Montessori was born on August 31, 1870, in the provincial town of Chiaravalle, Italy. Beginning in her early childhood years, Maria grew up in Rome, a paradise of libraries, museums, and fine schools. Her father was a financial manager for a state-run industry. Her mother was raised in a family that prized education. She was well-schooled and an avid reader—unusual for Italian women of that time. The same thirst for knowledge took root in young Maria, and she immersed herself in many fields of study before creating the educational method that bears her name. Maria was a sterling student, confident, ambitious, and unwilling to be limited by traditional expectations for women. At age 13 she entered an all-boys technical institute to prepare for a career in engineering. In time, however, she changed her mind, deciding to become a doctor instead. She applied to the University of Rome’s medical program, but was rejected. Maria took additional courses to better prepare her for entrance to the medical school and persevered. With great effort she gained admittance, opening the door a bit wider for future women in the field. When she graduated from medical school in 1896, she was among Italy’s first female physicians. Birth of a Movement Maria’s early medical practice focused on psychiatry. She also developed an interest in education, attending classes on pedagogy and immersing herself in educational theory. Her studies led her to observe, and call into question, the prevailing methods of teaching children with intellectual and developmental disabilities. The opportunity to improve on these methods came in 1900, when she was appointed co-director of a new training institute for special education teachers. Maria approached the task scientifically, carefully observing and experimenting to learn which teaching methods worked best. Many of the children made unexpected gains, and the program was proclaimed a success. In 1907 Maria accepted a new challenge to open a childcare center in a poor inner-city district. This became the first Casa dei Bambini, a quality learning environment for young children. The youngsters were unruly at first, but soon showed great interest in working with puzzles, learning to prepare meals, and manipulating materials that held lessons in math. She observed how they absorbed knowledge from their surroundings, essentially teaching themselves. Utilizing scientific observation and experience gained from her earlier work with young children, Maria designed learning materials and a classroom environment that fostered the children’s natural desire to learn. News of the school’s success soon spread through Italy and by 1910 Montessori schools were acclaimed worldwide. In the years following, and for the rest of her life, Maria dedicated herself to advancing her child-centered approach to education. She lectured widely, wrote articles and books, and developed a program to prepare teachers in the Montessori Method. Through her efforts and the work of her followers, Montessori education was adopted worldwide. As a public figure, Maria also campaigned vigorously on behalf of women’s rights. She wrote and spoke frequently on the need for greater opportunities for women, and was recognized in Italy and beyond as a leading feminist voice. Maria Montessori pursued her ideals in turbulent times. Living through war and political upheaval inspired her to add peace education to the Montessori curriculum. But she could do little to avoid being ensnared in world events. Traveling in India in 1940 when hostilities between Italy and Great Britain broke out, she was forced to live in exile for the remainder of the war. There she took the opportunity to train teachers in her method. At war’s end she returned to Europe, spending her final years in Amsterdam. She died peacefully, in a friend’s garden, on May 6, 1952. The Montessori Method of education, developed by Dr. Maria Montessori, is a child-centered educational approach based on scientific observations of children from birth to adulthood. Dr. Montessori’s Method has been time tested, with over 100 years of success in diverse cultures throughout the world. It is a view of the child as one who is naturally eager for knowledge and capable of initiating learning in a supportive, thoughtfully prepared learning environment. It is an approach that values the human spirit and the development of the whole child—physical, social, emotional, cognitive. Components necessary for a program to be considered authentically Montessori include multiage groupings that foster peer learning, uninterrupted blocks of work time, and guided choice of work activity. In addition, a full complement of specially designed Montessori learning materials are meticulously arranged and available for use in an aesthetically pleasing environment. Multiage groupings are a hallmark of the Montessori Method: younger children learn from older children; older children reinforce their learning by teaching concepts they have already mastered. This arrangement also mirrors the real world, where individuals work and socialize with people of all ages and dispositions. Dr. Montessori observed that children experience sensitive periods, or windows of opportunity, as they grow. As their students develop, Montessori teachers match appropriate lessons and materials to these sensitive periods when learning is most naturally absorbed and internalized. In early childhood, Montessori students learn through sensory-motor activities, working with materials that develop their cognitive powers through direct experience: seeing, hearing, tasting, smelling, touching, and movement. In the elementary years, the child continues to organize his thinking through work with the Montessori learning materials and an interdisciplinary curriculum as he passes from the concrete to the abstract. He begins the application of his knowledge to real-world experiences. This organization of information—facts and figures—prepares the child for the world of adolescence, when thought and emotion evolve into understanding more abstract, universal concepts such as equity, freedom, and justice. Copyright © 1998-2016 Coconut Grove Montessori School.